We present a system for covert automated deception detection using information available in a video. We study the importance of different modalities like vision, audio and text for this task. On the vision side, our system uses classifiers trained on low level video features which predict human micro-expressions. We show that predictions of high-level micro-expressions can be used as features for deception prediction. Surprisingly, IDT (Improved Dense Trajectory) features which have been widely used for action recognition, are also very good at predicting deception in videos. We fuse the score of classifiers trained on IDT features and high-level micro-expressions to improve performance. MFCC (Mel-frequency Cepstral Coefficients) features from the audio domain also provide a significant boost in performance, while information from transcripts is not very beneficial for our system. Using various classifiers, our automated system obtains an AUC of 0.877 (10-fold cross-validation) when evaluated on subjects which were not part of the training set. Even though state-of-the-art methods use human annotations of micro-expressions for deception detection, our fully automated approach outperforms them by 5%. 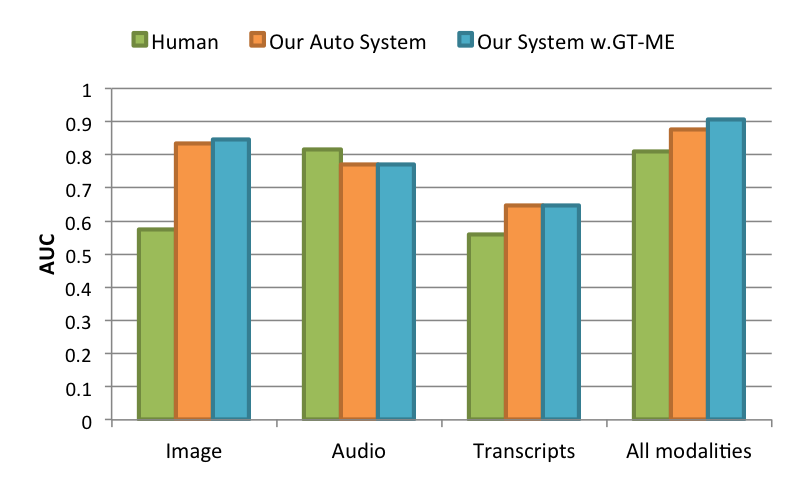 When combined with human annotations of micro-expressions, our AUC improves to 0.922. We also present results of a user-study to analyze how well do average humans perform on this task, what modalities they use for deception detection and how they perform if only one modality is accessible. Try our demo! You can select a video and click load to see our prediction. Also check the predictions under different modalities! We also show scores for other videos in the same validation split. Predictions of different micro-expressions are also presented. Thanks for Maksim Bolonkin’s help! We evaluate our automated deception detection approach on a real-life deception detection database (Perez-Rosas et al. 2015). To test human performance on this task, we perform two user studies using AMT (Amazon Mechanical Turk). In one user study, subjects are shown only one modality (i.e. 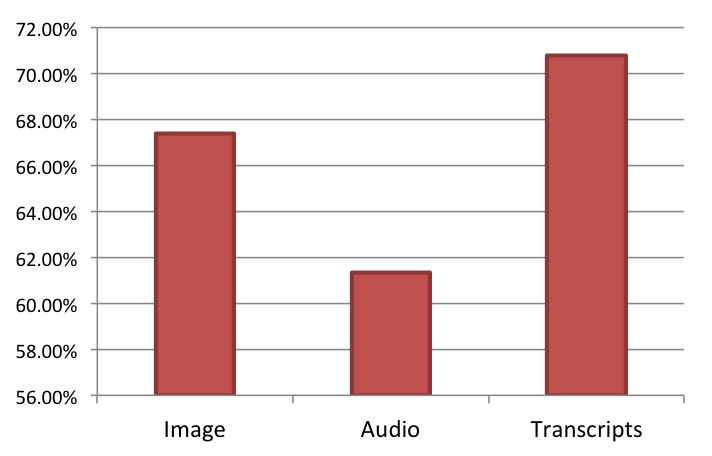 image, audio, transcripts) without access to other modalities. In the other study, subjects are asked to make a prediction for the whole video with access to all modalities. We also ask which modality contributes the most in their decision. The importance of modalities in making decisions (what humans think). Human performance in deception detection using different modalities is compared with our automated system and our system with Ground Truth micro-expressions. DARE is maintained by Doubaibai. This page was generated by GitHub Pages.